There is no image for the Marathon stone because photography was forbidden on the occasion when we saw it, and we have not been able to find any photographs. When one becomes available, it will go here. Nearly two years ago, I wrote of a missing Acropolis marble and the Marathon stone. Recently, thanks to the Times Literary Supplement of March 18 (p10) we saw a partial English translation, indicating that the text of the inscription has been published. The first two lines “Fame, as it reaches the furthest limits of the sunlit earth, / Shall learn the valour of these men: how they died” which turn out to be an immense improvement on the original publication, still involve translation of a line of Greek that could not possibly have been written even in the 7th century AD, let alone the 5th century B.C. We first saw the stone as members of a small group that was grudgingly permitted to make a hurried dash through a damp, poorly lit basement under the long-closed museum of the town of Astros, near the villa of the Athenian billionaire Herodes Atticus. Even rushed along, as we were, we could recognize from letter-forms, orthography and the rather odd format that this was part of an unpublished casualty list of the Athenians who fell at the battle of Marathon in 490 B.C. From the research blog for the Center for Hellenic Studies, we have a citation in Supplementum Epigraphicum Graecum, the internationally acknowledged authority for discussions and new discoveries in Greek epigraphy LVI, #430. Athens, a few having awaited the attack of many. But it seems even better for Fame to learn from this monument, rather than to report it. can be solved. As it is, the line is clumsily restored, (presumably by Spyropoulos) with a quite unnecessary extra syllable <ει> inserted to spoil the meter, and another, the õς of εὐφαõς, lengthened so that it makes the situation even worse. I hope regular readers will forgive a very short technical excursus here. This produces a slightly different translation from the ones given above, in that it is Fame that is brilliant, rather than the ends of the earth. A few, accepting battle against many. εὔφαος, incidentally, is not found in the Thesaurus Linguae Graecae database, but it is a perfectly reasonable formation, and would agree with the feminine noun Φῆμις. 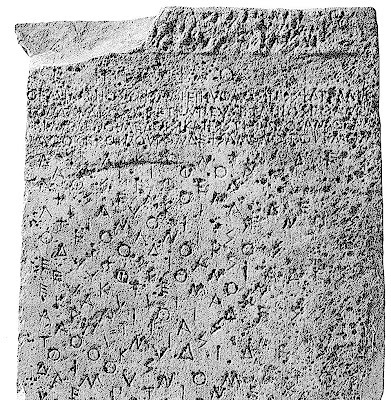 Of at least as much interest as these epigraphical quibbles, however, is the fact that the first general access to this extraordinary inscription is in translation, in a review in the Times Literary Supplement. It seems to have been around for several years. The editors of SEG speak well of an article, G. Steinhauer. Horos 17-21 (2004—09) 679-92, but I could not expect to see a copy of this in fewer than three weeks, so I cannot evaluate the reasons which may have led Steinhauer to stick with Spyropoulos’s present tense here, where the unaugmented gnomic aorist would seem very much preferable on all counts. If we ask how the inscription got to the villa in the Peloponnesos, the answer is likely to be that it was taken there by a self-indulgent plutocrat whose wishes could not well be ignored. Until now, I had regarded the quaintly archaic accusation of “Aiming at Tyranny” that was more than once directed against Herodes Atticus as a sort of petty vendetta, but this fragment, effectively looted from Attica has led me to reconsider the charge. Herodes may have forced or bribed a subservient Athenian administration to permit the looting, but it was still looting, rather like Lord Elgin’s arrangement with the Ottoman authorities to take away marbles surrounding the Parthenon which were otherwise destined for the lime-kiln, or the repairs to the lower courses of the Acropolis wall. There is some irony in the preservation of this fragment and the Elgin marbles because they were looted, but there is the difference that the Elgin marbles have been on public exhibit for more than a century, and there is no indication that this Marathon fragment, or its fellow artefacts, have been set free from their damp tomb. 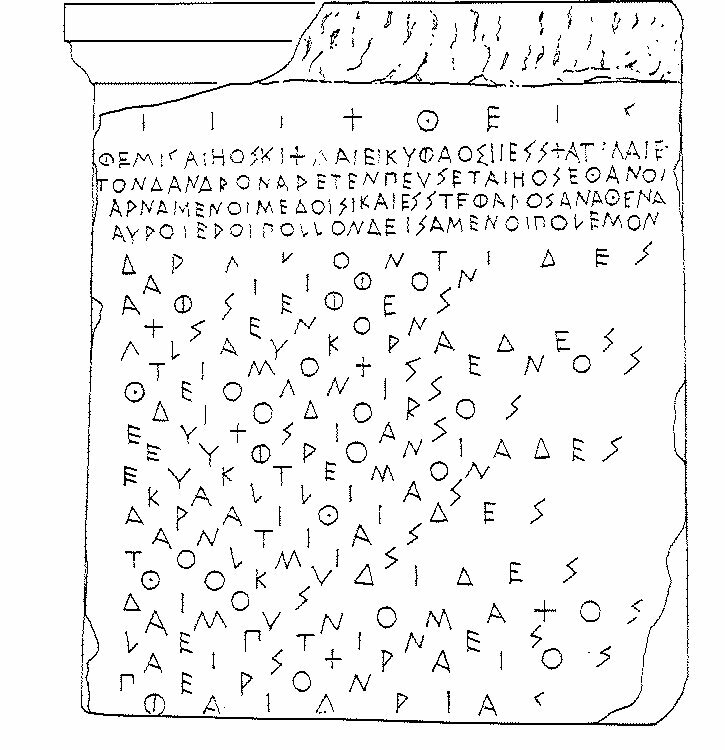 The Horos article cited above informs us that G. Spyropoulos uncovered this stone between 1980 and 2001. We might recall, that when the German Archaeological Society discovered the glorious inscribed bronze Persian helmet from Marathon (ΑΘΕΝΑΙΟΙ ΜΕΔΟΝ ΛΑΒΟΝΤΕΣ) in the excavations at Olympia, they exhibited photographs of it in the very same year. Thanks for discussing this important inscription! Your restoration also seems very likely. I'll bring this up in my Herodotus class this week- we just finished reading the Battle of Marathon. 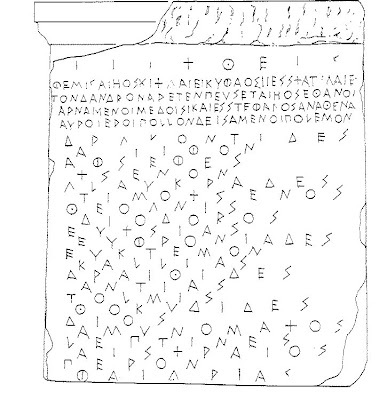 The text as made available to SEG omits a name, Ἀραιθίδες, after Καλλίας. Also, a comparison of the drawing with the published transcription of names shows some discrepancies. Many thanks for this enlightening entry. 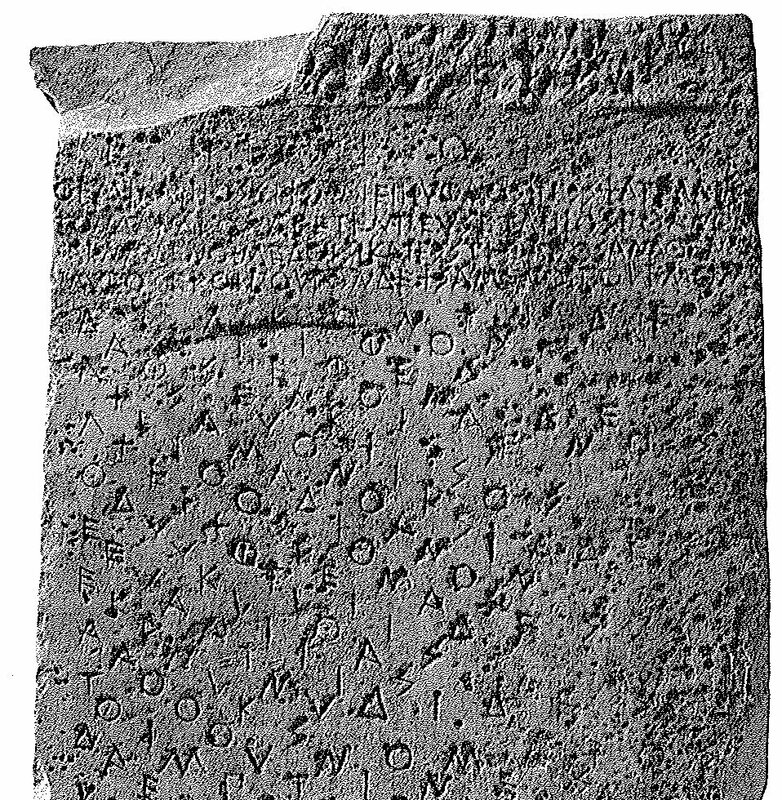 To the best of my knowledge (I have not seen the article in Horos), the existence of the inscription was mentioned for the first time in the commercial edition of the German-language dissertation of Georgios Spyropoulos, Drei Meisterwerke der griechischen Plastik aus der Villa des Herodes Atticus zu Eva/Loukou (Frankfurt am Main etc. 2001) 22. Of course, mentioning a text is a far cry from presenting the public with an edition (let alone with an edition which comes up to scholarly standards). The first publication of the text was, I think, in a 2009 Greek booklet by Spyropoulos, Oi stêles tôn pesontôn stê machê tou Marathôna apo tên epaulê tou Êrôdê Attikou stên Eua Kynourias, Athens, 23-36; as such, it was acknowledged (“Following extensive press coverage see now ...”) by Catherine Morgan in Archaeology in Greece Online: http://chronique.efa.gr/index.php/fiches/voir/904/. Understandably, the editors of the SEG have preferred to refer to Steinhauer’s edition as the editio princeps. Many thanks for this enlightening entry. The underlying story of Herodes’ blatant appropriation of Athenian history is thrown into relief when read in connection with the record of his burial and of the vicissitudes of his funeral monument as discussed by Joseph Rife, in a fascinating article in the Journal of Hellenic Studies 128 (2008), 92-127. Herodes died in the late 170’s and was, contrary to his own wishes, not buried in Marathon, the hamlet in Attica his family came from, but next to the Panathenaic Stadium in Athens, that he himself had rebuilt for the Panathenaic Games of 140. During or shortly after the funeral an altar to 'Herodes, the Marathonian hero' was dedicated at the site. Interestingly, Herodes' name was erased from the altar within the next few generations, and about the middle of the third century his sarcophagus was re-used. One is tempted to believe in the Revenge of the true Marathonian heroes. "In my research blog,[link above] in which I simply wanted to make the text known to my colleagues here at the CHS, I rhetorically asked the question about the crux of L.2 I have talked to several people about this line and most of us have come to the conclusion that the most likely reading is the gnomic aorist. [Pierre MacKay] may be right about the interpretation of ΕΥΦΑΟΣ. I am afraid that one has to study the stone anew since neither the photo nor the drawing are very helpful on this point. one nor do I have access to his book right now. Finally, in the text printed in your blog the last name should be Φαι[δ]ρίας." Thank you for the inscription's text. I guess you have omitted the text after line 5: the person's name "Drakontides" as the first of the dead soldiers. Thank you for taking the time to write. And thanks to the rest of you.